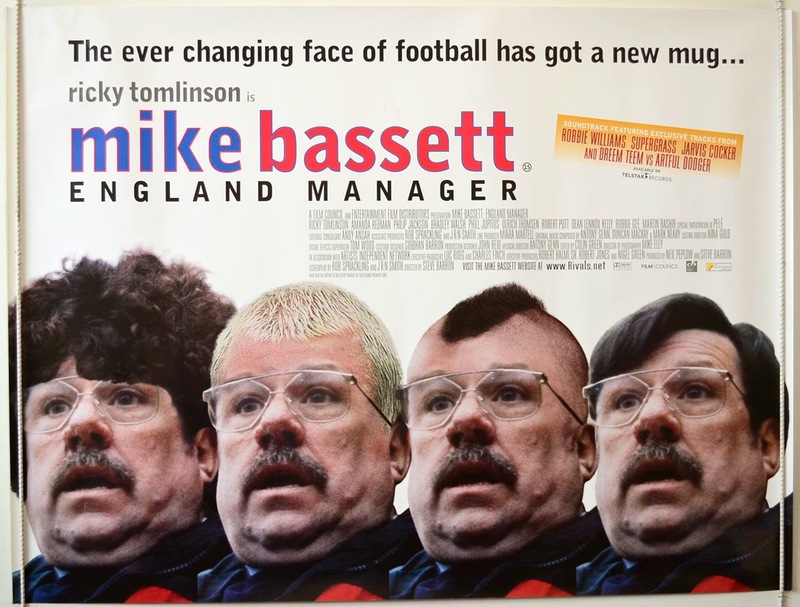 Released in 2001 as a prelude to the 2002 World Cup, Mike Bassett: England Manager is a spot-on parody of not only the English management set-up, but also of the game in general. But far from being a film that points fingers and criticises, it is a movie that highlights the stupidity and the hilarity of characters, situations and organisations in a manner that should please all football fans. Ricky Tomlinson is the perfect choice to play Mike Bassett. He has a regional dialect, he says what's on his mind, he looks nothing like a footballer but claims to have a brilliant understanding of the game - in short, he is the common man, which many would argue is nothing like the England manager. But that's why the casting works: he is the polar opposite of how an England figurehead would behave (although some situations are not too dissimilar to those encountered by certain men who have had the job, albeit behind closed doors). Tomlinson is best known for playing Jim Royle in The Royle Family, but he is just as effective and just as funny in this role. The tale (produced as a mockumentary) begins with the health-induced end of the England managing reign of Phil Cope (humorously accompanied by the newspaper headline "Can't Cope"), and after every top candidate is ruled out or rules themselves out, the FA has to turn to second-string boss Mike Bassett for the top job. His task is simple: one win in the last three World Cup qualifiers and England will grace the main stage. But, instead, the side make a pig's ear of it: two defeats are followed by a draw which is made worse by a shocking penalty miss which would have guaranteed qualification. Fortunately for Bassett, an unexpected result elsewhere in the group allows them an alternative passage to the tournament. Unfortunately, whilst the road to glory was tough on Bassett, the tournament itself provides more nightmares: an appalling 0-0 draw with Egypt is followed by a heavy defeat to Mexico. On the brink of elimination, and most likely the sack, Bassett is encouraged to turn to alcohol to ease the tensions. This only leads to a drunken escapade, caught on camera, which points an even greater spotlight on him. Despite widespread calls for him to resign, Mike refuses to step down but, when he is heavily criticised by the media, his response is powerful enough to win back some support from the die-hards. But his future still rests on the outcome of the final group game against Argentina; can his side pull off a miracle or is it bye-bye Bassett? The plot is enhanced by the number of satirical stereotypes for players in the squad, from the alcoholic playmaker (Kevin Tonkinson, played by Dean Lennox Kelly) to the ultra-aggressive defender (Gary Wackett, played by Geoff Bell), as their troublesome situations are comedic yet true-to-life. This extends to the dugout, as Bassett's assistants include a spineless yes-man (Dave Dodds, played by Bradley Walsh) and an old-fashioned coach more interested in his used car business (Lonnie Urquart, played by Philip Jackson), a clear parody of Graham Taylor's management during his tenure as England boss. In fact, the pre-World Cup section is largely based on Taylor's reign, from the poor results to the media scourge. Post-qualification, the film focuses on the pitfalls of the job, albeit in hilarious fashion; don't expect Roy Hodgson to swear at his own fans in the same way that Bassett does after the Egypt game. Other elements of the parody, which are nevertheless true, include how the manager's wife Karine (played by Amanda Redman) and son Jason (played by Danny Tennant) can feel the brunt of the national side's poor performances by association with the figurehead, and how the English media builds the team up to knock them down, almost resenting their success. The movie also features several celebrity cameos, such as Pele, Ronaldo (the original Brazilian one, not Cristiano) and Atomic Kitten. There is a danger with films like this that they will either insult the audience or come across as being too serious. However, the movie is nothing of the sort: it raises some intriguing points about the English football set-up and aspects of life as a manager in this country, but it makes its points and tells its story through a range of truly funny incidents, visuals and one-liners. Tomlinson's half-time team talk when they're losing to Mexico is priceless. His general reactions to the bewildering situations he finds himself in (from the lacklustre training mechanisms to the incorrect team selections which sees lower-league players called "Benson" and "Hedges" included because his squad was written on the back of a cigarette packet) are brilliant. And even the supporting cast are really funny, particularly Jackson who as assistant manager only has a minor role, but is totally believable and, whilst understated, his restrained delivery is what makes his material work. Something I also appreciated was how it didn't follow the perfect story arc: some developments are a little predictable, but without spoiling the plot, you will realise that it doesn't just go for the simple rags-to-riches-style story. The movie eventually spawned a TV series in 2005 based on domestic management (which I felt was a little disappointing), and rumours continue to suggest that a sequel to the movie is coming soon. Mike Bassett: England Manager is the kind of film that you want to watch in the run-up to a major international tournament. Alternatively, it is a great football comedy to watch at any time because it is really funny and, whilst it was made in 2001, many of the pastiches are still relevant today. In fact, it is darkly comical that for all the ridiculous incidents that are encountered here, the vast majority are only slightly exaggerated versions of real-life events, characters and situations. So, if you are a die-hard football fan, a casual supporter or just someone looking for a funny British film, an ideal movie for you is Mike Bassett: England Manager.